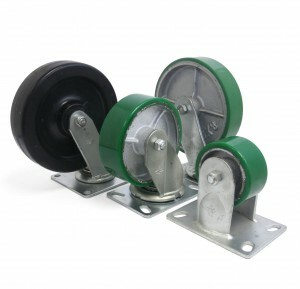 Sunray’s Casters can provide valuable solutions for your immediate needs. Click on size to order and for specifications. DON’T SEE THE CASTER YOU NEED?? CLICK HERE to contact us! Top plates and legs are made from .25″ cold forged steel. Large top plate and raceway combine ease of swiveling and strength. .75″ Nut and bolt kingpin. Zerk grease fitting in axle, swivel bearings and on most wheels. Integrated top lock brakes available on both swivel and rigid casters. 90 position locks available on swivel casters. Call: 1-800-833-9960 for more information!